Chris Van Allsburg has always been the Rod Serling of the children’s literary world. Of that there can be no question. With no other author, not Gorey, not Snicket, not even R.L. Stine himself, will kids encounter that eerie feeling that can only be best associated with classic Twilight Zone episodes. All his picture books (even nonfiction ones like Queen of the Falls) suggest to the reader that ours is a world not far removed from the ones featured in his books. Maybe coloring books really do have lives of their own before children get to them. Perhaps strangers with amnesia really do have a special relationship with the seasons. And that board game you find one day? Fuggetaboutit. Of all his books, mind, the one that really touched this eerie quality best was The Mysteries of Harris Burdick. I can think of no other picture book that has covered such ground. Back in 1984, Burdick dared to simply imply stories rather than tell them. Its mysterious pictures, each with a single line beneath, hinted at whole worlds. Now fourteen writers for children have been tapped to interpret these stories themselves, to varying degrees of success. Whether you love all the stories, some of the stories, or just a few of the stories, this is one of the better short story collections for kids out there. Its success, however, hinges entirely on its authors’ ability to understand Van Allsburg and his tone.Fourteen authors. Thirteen stories. One introduction by Lemony Snicket. 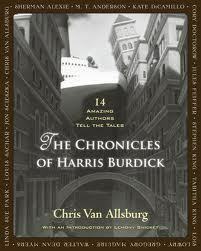 Each author takes an image from Chris Van Allsburg’s The Mysteries of Harries Burdick and writes a short story about that image. The results are as varied as can be. Jon Scieszka seemingly channels Roald Dahl with his satisfyingly short “Under the Rug”. Stephen King, in contrast, presents the longest story with “The House on Maple Street”, though it is no less satisfying. Kids reading this book will find droll writing from Linda Sue Park, a Truman Show-esque tale of caution from M.T. Anderson, and a true epic fantasy from Cory Doctorow. By the end some authors have successfully plugged into the Van Allsburg mindset while others have struggled, but while the stories might be touch and go, they are never, ever dull.Short story collections for kids can be such a mixed bag, particularly when different authors write them. You’d actually find a lot more consistency in a collection by a single author (like Strange Happenings by Avi, say) than one with fourteen different people. In the case of this particular book, I found myself judging the stories on two entirely different levels. First, there were the tales themselves. Were they adequately interesting? Well-written? Something a kid would be compelled to read? Second, how closely did the authors actually look at the images they were supposed to interpret? In short story writing there can be no “wrong” storytelling, yet I often felt far more compelled to give credit to the writers that knew how to use a picture as inspiration rather than as a mere starting point.Let us consider the quality of the tales, first and foremost. Some writers wrote tales that were whole and complete stories. Stephen King’s consideration of a space-bound house, say, or Jules Feiffer’s tale of an elderly children’s author. Other authors sort of took their tales and used them to tell the beginning of a story. Cory Doctorow’s fascinating look at alternate realities did that, as did Sherman Alexie’s tale (which, along with M.T. Anderson’s, ambles the closest to Van Allsburg’s own penchant for the dark and mysterious). But those authors that wrote what felt like the first chapter in a book actually became the most interesting of the lot. They hearken back to the original Harris Burdick and its role in classrooms around the country. For years creative writing teachers have used the picture book and its illustrations to inspire kids to continue the tales. So stories like Doctorow’s or Alexie’s sort of end up doing the same thing. A kid could read their tales and be inspired to continue along the same lines. That said, some of the stories just didn’t do it for me storywise. Tabitha King who, to the best of my knowledge, has never written for children before, is a strange inclusion in this collection. Her story “Archie Smith, Boy Wonder” promises much with its title and image. Sadly, it doesn’t deliver (making me suspect that hers is the first story in the collection for a reason). And interestingly, looking back at the book I found myself forgetting Van Allsburg’s own story (a fact I find relatively ironic). It’s perfectly nice, but I couldn’t conjure you up the details if you asked. Then there was how well and author interpreted their picture. There was a great deal of variation in this. Some authors were shockingly faithful. Gregory Maguire’s tale “Missing in Venice” really does manage to come up with a reason why an ocean liner might be traversing the too small canals of that great city. “The Third-Floor Bedroom” by Kate DiCamillo starts out by sounding like it might go in a different direction, then justifies everything by its story’s end. Other authors were vaguely faithful. Lois Lowry’s “The Seven Chairs” uses the line that accompanies its image (“The fifth one ended up in France”) though not with the scene that we see of a nun floating high above two priests. That’s okay. It’s cheating a little, but it isn’t too bad. Then there are the authors who clearly just glanced at the image and quote and didn’t feel the need to really pair their stories to the images. I’m torn on the Walter Dean Myers story “Mr. Linden’s Library” since the storyline feels very Van Allsburg, even while it has little to do with the accompanying picture of a woman asleep in front of a vine-spewing book. Louis Sachar, however, may have paid the least amount of attention to his image. In his picture a captain signals a boat with a boy by his side. Look closely at the picture, however, and you’ll see that the captain has a firm grip on the boy’s upper arm, so as to keep him from escaping. Sachar latched on to the boy and captain idea in “Captain Tory” but the drama of the scene has completely escaped him. Ah well. I told someone I know about this book recently and they responded with sadness. “Oh, what a pity. The whole point of The Mysteries of Harris Burdick was that kids could make the stories out to be whatever they wanted.” True, I suppose, but I don’t see this book as being anything but a natural extension of the original. There’s nothing to say that teachers can’t continue to use the first book for assignments, then show the kids this book as a follow-up. And who knows? Maybe the kids will read these stories on their own, think to themselves “I can do better than that!”, and be inspired to write their own versions as well. Hey, stranger things have happened. Above and beyond all of that, however, this is just a really good collection of stories for kids. Eerie and wonderful. Strange and unpredictable. You may not love every story in here, but the ones you do care for will burn strong and bright in your memory, long after the weaker ones have faded. If I were to recommend to you one short story collection to kids published in the last ten years, this would be the one I’d hand over.For ages 9-12. Actual rating: 3.5 stars. The best stories in this collection have a sense of possibility, of capturing a moment at the beginning or in the middle of a much larger tale, inviting the reader to continue off the page with their own imagination. Those are also the stories that, for me, capture the spirit of the original Harris Burdick book (which I inexplicably found in my house – how did it get there?) -- the endless promise, and the strange and wonderful and dreadful directions in which each illustration can be taken. Some of these stories end right before you expect them to, in a dramatically ambiguous way. Jon Scieszka’s funny but creepy “Under the Rug”, about a man who doesn’t like his nagging Grandma much, ends like this; you think you know what’s to come, but it ends right before the big moment, on such a note that you can imagine it going another way. (view spoiler)[Maybe the Grandma pulls a Hansel and Gretel and feeds the narrator to the Dust Demon, right? (hide spoiler)] Jules Feiffer’s melancholy and weird “Uninvited Guests”, about a children’s book illustrator who has no real people in his life anymore, does the same thing. Others are even more enigmatic: they don’t really end at all. Where they end (or when, I should say) feels right, but they don’t provide closure in terms of plot. They spiral outward in multiple directions at once, like the handcar with the sail in Cory Doctorow’s fantastic fantasy of multiple universes, “Another Place, Another Time” or they stop abruptly at the most unsettling moment possible, as in Sherman Alexie’s “A Strange Day in July”, about mean-spirited twins who invent a third sibling and find that she is just as mean-spirited as they are. Walter Dean Myers’ “Mr. Linden’s Library” also does this; it tells the story of a girl who is sucked into a never-ending book about a boy swimming in the midst of the sea without ever reaching shore, and the ending is evocative and sad but suggestive of more to come. (Like the story she’s in, it will never truly end.) “The Third-Floor Bedroom” by Kate DiCamillo also has a suggestive ending, but a less sad and more hopeful one; it reminded me a lot of “The Yellow Wallpaper” at first, but took it in a less creepy direction so it ended up being about a woman’s growing understanding of herself, compassion for her caretaker, and hope for the future, instead of a descent into madness. (Oh well. )My favorite story is MT Anderson’s “Just Desert”, which calls to mind another of his disturbing short stories I’ve read, “Watch and Wake” in Gothic: Ten Original Dark Tales. Both left me feeling off-kilter, with goose bumps, because they present a terrible, disorienting sensation that something we’ve always trusted unconditionally (like the existence of the world; the existence of the self) is a vulnerable, fragile construct. This story is just awesome, and uses the illustration as a jumping off point for truly strange developments.Of course, those stories that are complete in themselves still use the illustrations and captions to good effect (for the most part) and many are quite memorable, such as Stephen King’s “The House on Maple Street” and Linda Sue Park’s “The Harp”. They are just not my favorites -- maybe because they have heartwarming endings and not creepy ones, which is just my poor taste showing. Like most collections, there were a few stories that didn’t work for me (okay, five). They weren’t poorly written and they will probably appeal to other readers. I thought Tabitha King’s “Archie Smith, Boy Wonder” was oddly pointless, like it missed the point both of the illustration and of how to write a story for children. Gregory Maguire’s “Missing in Venice” worked in the image of a big ship in a narrow canal in a way I didn’t expect (I think because of how literal it was) but I was impatient with the narrator and the plot. Lois Lowry’s “The Seven Chairs” had too sentimental of an ending and not much plot. I like the way Chris Van Allsburg’s “Oscar and Alphonse” ended (another example of a story that felt like a beginning of a larger tale) but otherwise it didn’t have enough detail to really draw me in; it didn’t feel fleshed out enough for me to believe the caterpillars knew the answer to the “mystery of life” (maybe I missed the point on this one, though, because obviously I am taking that one too literally). And while “Captain Tory” by Louis Sachar was a nice story about a beloved ghost discovering a new life, I don’t think it did justice to the illustration. It’s a very basic story for such a complicated picture.Oh, and Lemony Snicket’s paranoid introduction is hilarious. The whole book is a conspiracy, but we all have to pretend otherwise, because like a true mystery, we will never know the answer. It's perfect for a collection like this and a lot of fun to read.I would be very interested if they published another volume of this book, with different stories for the same illustrations, even written by the same authors or written by new ones. That probably won't happen, but it would certainly be a cool idea, to keep the open nature of the original alive. One of my favorite children's books of all time is The Mysteries of Harris Burdick by Chris Van Allsburg. I was so excited to find a story by Stephen King based on one of the illustrations in Nightmares and Dreamscapes, so I was 14x excited to find that a whole book of short stories based on the illustrations was coming out! These are stories that would appeal to a wide range of children and teens, and probably many adults as well, just like the original book. The stories are filled with magic and creepy twists. I was kind of surprised that most of the stories ended with the illustration's caption - so that there was still quite a bit of mystery left. (I wrote a story several years ago based on "The Third Window," and I started it with the caption). One of my favorite stories in the collection was "Just Deserts" by M.T. Anderson, I think because I had always thought this was a typo - shouldn't it be "just desserts"? The variation in spelling is explained in the story, and I did not see the twist coming. "The House on Maple Street" by Stephen King was another of my favorites. I was very intrigued by the "Oscar and Alphonse" story by Chris van Allsburg himself - did he write other stories based on The Mysteries of Harris Burdick, and where are they? Though I've read many of his books, this short story seemed a departure from the children's stories.My hope is that more authors come forward with stories they've written based on The Mysteries of Harris Burdick, and there is a volume 2! When I was a young child, I wrote a letter to the publisher of The Mysteries of Harris Burdick, offering my theories on what might have happened to the author. I was such a cute, precocious little nerd. Now as an adult I can obviously tell who really illustrated that book, but it's still much beloved by me. I was super excited about this collection, but I felt like it was just OK. There weren't a lot of standout stories for me. I found it really interesting how many times sailors and sea voyages were themes, and how many times the authors chose to end their story with the quotation from the original picture book. Lemony Snicket's intro was amazing and I loved the story by MT Anderson, but this wasn't a must read like I'd hoped. Also it was bizarrely categorized as a Young Adult book at my library which I think is because a lot of the authors write for teens but I think it holds more appeal for people like me who read the original book as children. 2.5 out of 5I just HAD to read this short story collection after reading its source of inspiration, The Mysteries of Harris Burdick.Eh, I guess my expectations were too high... Hey, but look at the impressive author list! It DOES sound too good to be true, hahaMy favorite piece was Lemony Snicket's introduction. I also liked the stories by Jon Scieszka, Stephen King, M.T. Anderson and Louis Sachar. The others (by Sherman Alexie, Gregory Maguire, Cory Doctorow, Jules Feiffer, Linda Sue Park, Walter Dean Myers, Lois Lowry, Kate DiCamillo and Chris Van Allsburg) ranged between okay and meh. Tabitha King's story was by far the worst (or I completely missed its point).P.S. Check out this review by The Rusty Key. It nicely summarizes most of my own thoughts. Allright! One book and I get to pass judgement on fourteen writers! Here goes:Linda Sue Park 4.8 starsReally fantastic. Intricate, interweaving of story lines with a great "hook". Hard to believe a story this nearly perfect was written as an excercise. Amazing.M. T. Anderson 4.7 starsVery nearly my favourite story of the collection with a great twist ending sure to blow the minds of young readers. A perfect match to the illustration.Kate DiCamaillo 4.6 starsShe makes cat nip out of most of her peers - writing wise that is. She strikes the perfect tone. She rocks. Louis Sachar 3.4 starsRather touching, but I didn't buy the tacked on happy ending.Chris Van Allsburgh 3.3I wonder if Chris served himself a big fat slow pitch right into his own wheel-house. Of all the illustrations,this one practically writes it's own story, but I do appluade him for not succuming to the temptation of killing off one (or both) of the protagonist's parents before the story begins - a temptation few of the other writers could resist. Anyway, Van Allsburgh dutifully knocks it out of the park but since he did so in batting practice rather than in the playoffs he gets only a middling score.Walter Dean Myers 3.2 starsA solid enought story if a little dull. It did not match the illustration very well.Sherman Alexie. 3.2 starsVery humorous but slap-dash.Jon Scieszka. 3.1 starsHumorous but slap-dash.Stephen King. 3.0Formulaic and predictible - and a poor match to the illustrationGregory Maguire. 3.0 starsMeh.Jules Feiffer. 3.0 starsKinda weak.Tabatha King. 3.0 starsKinda sappy and lacking in any tension. Matched the illustration well.Lois Lowry. 2.9 starsI think her agenda gets in the way of her art and she seems to miss the spirit of the illustration.Cory Doctorow. 2.5 starsThe Illustration didn't fit the story and the story fell flat.So...3.19 stars, rounded down. More like 3.8 stars...I'd "read" the original book by Chris van Allsburg years ago, and was really excited to see that some of my favorite authors had written stories to go along with the fabulous illustrations. Some of the stories were great: Another Place, Another Time by Cory Doctorow about parallel universes; Mr. Linden's Library by Walter Dean Myers about the power of books. Some were really good - I particularly enjoyed the fantasies: The Harp by Linda Sue Park about bickering sisters who fall under a wizard's spell; The Seven Chairs by Lois Lowry about an empowered flying nun; Just Desert by M. T. Anderson, with an interesting twist about staying in your own neighborhood. A couple were heartwarming: The Third Floor Bedroom by Kate DiCamillo with a sister writing letters to her soldier brother and Oscar and Alphonse by Chris Van Allsburg about caterpillars who can spell. I was sort of disappointed that the Stephen King was an old short story, but I think he was originally inspired by the same picture, so I guess that's fair. I didn't enjoy the other five stories as much as I'd hoped, but the book is still worth reading for the best ones. I still think that this would be a great creative writing project for students. When I was in grade 5 or 6 (some time in the late ‘90s) my teacher decided that we were going to do a literary unit on Chris Van Allsburg. The weeks that followed had us reading Jumanji, The Z was Zapped, The Polar Express, and every other Van Allsburg book that we had available in our school library. With each book we did a project and the one that went with The Mysteries of Harris Burdick was my favourite. That’s because the project that we did was this book.Ok, it wasn’t this book exactly, but everyone in the class had to sign up for one of the pictures and write a short story incorporating both it and the caption below it. This collection is a wonderful use of the imagination that will captivate audiences all over the world. It really showcases the power of a picture and how it can help form an entire stream of consciousness. I give it 9/10. My thanks to both netGalley and Houghton Mifflin Harcourt for the opportunity to read this. Stay tuned for a more in-depth review closer to the publication date. I've owned this book for years; a gift from my awesome husband who knew I would be absolutely delighted to see the the illustrations of Harris Burdick come to life with stories by authors who I know and adore. This summer I finally sat down to read this gem only to discover that the stories were… Strange. Fantastical. Definitely for outside-of-the-box thinkers.I honestly enjoyed probably one story in this collection. (Props to Sherman Alexie's "A Strange Day in July" for jussssst the right amount of creepy!) And after that… I just felt so disappointed because there's no way my 8-year-old students at school who are mystified by the original book will be able to wrap their heads around these stories. If I was teaching an older bunch this might go over better, but for my group… they just would not understand it at all. I could see some adults I know really enjoying these weird, short stories. But as for what I hoped it would be, it's a big letdown in my book. Short stories are often what stick in my head. So reading this for the second time was like turning a light on in my mind. Caterpillars that do math. Metal that invades houses. Ships in Venice. Fake pumpkins. These stories and pictures will randomly pop into my head, and often I have no idea where they are from. Now I do. My favourite stories are "Missing in Venice" by Gregory Maguire, "Just Desert" by M. T. Anderson, and "The House in Maple Street" by Stephen King. But I also really love "The Seven Chairs" by Lois Lowry and "Oscar and Alphonse" by Chris Van Allsburg. And all the other stories. And the introduction by Lemony Snicket. So yeah, I really love this book. I had never heard of the whole Harris Burdick concept until Katie picked this for her book club selection. Which is strange to me, because I feel like I should have heard of this super creative and kind of really awesome concept of Chris Van Allsburg publishing illustrations with captions next to them, and encouraging the audience to tell their own stories. Like I said, super creative. I really approve. The neat thing about this book is that it takes that concept and applies it on a pretty large scale, in that well known authors, both YA and adult focuses, were given an illustration and told to write a story for it. A very nice way to close out book club for our summer session, as we get SO MANY VOICES in one work. And like all of my reviews of short story collections, I will talk about my favorite ones and go from there.Shock and awe, two of my favorite stories were the ones by Sherman Alexie and Stephen King, two of my favorite authors as it is. Sherman Alexie took the story 'A Strange Day In July', which has the caption 'He threw with all his might, but the third stone came skipping back' along with a picture of two distressed looking children. Already the premise is a little creepy and delving into the Uncanny. Alexie takes it a few steps further into the utmost terrifying, something I didn't so much as expect from him! His two protagonists are a couple of bratty twins who think it would be quite funny to stuff a dress and insist that people refer to it as their triplet. Unfortunately for them, it kind of takes on a life of it's own. I TAKE SO MUCH ISSUE WITH THIS because of that damn horror story 'Harold' in SCARY STORIES TO TELL IN THE DARK 3, about a Scarecrow that comes to life and kills the people who made it. Kind of a similar concept, but far more ambiguous. Gross. Super scary.Stephen King took the story 'The House On Maple Street', which has the caption 'it was a perfect lift off' and shows a house starting to rocket into the sky like a space shuttle. Does Stephen King make it a fanciful story about a science fiction-y house that can travel through space. OF COURSE NOT. He makes it about an abusive step father, something growing inside the house, and his step children plotting his demise through a rocketing away house. My goodness. I really liked how King took a picture that could have gone in so many obvious directions, but went in a very creative and intriguing way that explored the human condition just as much as it explored a house that can travel through space.And finally, I really liked the story that Walter Dean Myers did. It is called 'Mr. Linden's Library', and it has the caption of 'He had warned her about the book. Now it was too late', accompanied by a picture of a girl next to an open book that has leaves sprouting out of it. Myers makes the story about a girl who gets some books from a book owner that seem to take on lives of their own. It definitely had a 'Neverending Story' feel, which I greatly appreciate because that's one of my favorite books of all time. This one definitely had a darker tone to it, however, which I found to be very creepy and therefore entertaining.So why does this only get three stars? honestly, it's because not many of the other stories stood out to me as much as those three did, all of which I would give solid fours, perhaps a five in Alexie's case. I think that the pictures are really wonderful, and still very much open to interpretation, but none of the others really stood out for me, which was kind of too bad since there are some really impressive writers in the bunch. Outside of those three, not many of them were really reach out and grab you ones (though Tabitha King's was a very nice starting out story, and should be mentioned at least in passing). Overall, I'm really pleased that this concept has been tweaked with and taken on so many lives. Knowing that this project is out there for kids and adults alike is a very valuable tool, I think, and I believe it could be a very fun classroom or library project. I came across this book while looking for a book club book for the adult literacy program I work for. The reading level and book length are on spot--I think this could be a good choice, although it would probably make a good book for October which has already passed. This book is essentially a companion book to "The Mysteries of Harris Burdick" which is a book with pictures, their titles, and short captions, and the reader is left to imagine the stories that the pictures go with. THIS book gives the readers stories to go with those images, all penned by famous authors; Sherman Alexie, Lois Lowry, and Stephen King to name a few. The work of Chris Van Allsburg is unmistakable and all the images in this book, pulled from "The Mysteries of Harris Burdick," manage to be both serene and bizarre all at the same time. My favorite images were:1) The Seven Chairs 2) Another Place, Another Time3) The House on Maple StreetThe accompanying stories to the images are equally bizarre (hence, my thought that the book would make a better October book club selection). My favorite stories were: 1) Just Desert2) Another Place, Another Time3) Under the RugI already have a fondness for anthologies and expected to like this book. While I did end up liking the book a great deal, I have to say this book really surprised me. Granted, the illustrations are strange and it's probably stupid that I didn't expect the stories to be just as strange or even disturbing, but I really didn't--and they totally were! This book is put in the children's section of my library and I can't help but wonder if kids could really, truly appreciate the nature of stories like this. Probably a dumb thing to think, but my experience with kids is a bit limited, and I was reading this with the adult learners in our program in mind anyway. I actually think this book would provide a much-needed, healthy stretch of the imagination for our book club participants! I will definitely keep this one in mind as a future book club selection. Very very rarely, I will swoon over a book. Swoon-worthy books must not just be well-written, they have to be beautifully packed, or have exquisite illustration, mostly, all three. Four stories into The Chronicles of Harris Burdick I was already swooning. Mind you, this is the ARC, too, not the gorgeous hardcover that will be the best holiday gift when it hits shelves.What strikes me as I read- one story at a time, with space between each to savor- is the inventiveness of the writers. Van Allsburg's illustrations are surrealistically magical drawings, but they are snap shots. The ability to see the past, future, and alternative presents hinted at in these illustrations is an amazing imaginative feat.Strangely enough, they now have my mind turning to Lev Grossman's The Magicians. There is a kinship here, I think. Both loved, enjoyed, and familiar, yet strange, surreal delights. Not matter how many times one sees a Van Allsburg drawing or reads a Lev Grossman novel, they will be strange and mysterious, even if you feel, as I do, that you somehow know them, even during the first reading.From a darkly humorous story by Jon Scieszka to the fearful hint of magical oddness in Stephen King's, The Chroicles of Harris Burdick will leave readers spellbound. Adults who remember writing their own Harris Burdick stories and readers ages 10 and up will enjoy the strange magic of the tales. In a collection featuring such incredible authors as this, it will be difficult to choose a favorite. OMG, OMG, OMG!!!! I tend to pass on reviewing a lot of children's literature because I don't want to hurt feelings of people who may, if I ever publish another work of fiction, be in a position to review my work. But sometimes I read something that is so great that I have to tell the world. I have always adored The Mysteries of Harris Burdick by Chris Van Allsburg - a collection of incredible artwork with captions only. They are so inspiring. Now, some brilliant person decided to ask authors to write stories to go with the pictures and captions. The authors are the best - Stephen King, Tobin Anderson, Walter Dean Meyers and Lois Lowry, to name a few and they do an amazing job. I am not a huge fan of the short story genre - too intense for me - so I read these over a few days so as to not freak myself out (like watching a Twilight Zone marathon). Some were not as good as others, but all were still fabulous. What people chose to do with these illustrations was so creative. One thing that I couldn't help but be surprised about was that ALL of them used the illustration as either the climax or the final scene of the story - I would have tried to start stories with many of them - shows what I don't know!!! !BE SURE to read the foreword by Lemony Snickett - it's hysterical!!!!! Who is Harris Burdick? In his intro, Lemony Snicket tells us that Burdick dropped off fourteen beautiful illustrations, each with their own title and caption, to a stranger, promising he’d return with more illustrations and stories to match. But he never returned, and so fourteen writers have done their best to put a story behind each picture (or perhaps, as Snicket theorizes, these fourteen were contacted by Burdick in secret and given the stories to match, or had them hidden in their homes for safe-keeping).This book was recommended to me by my friend Mel, but even if she hadn’t pointed it out, the list of authors would have drawn me in. We’ve got: Tabitha King, Jon Scieszka, Sherman Alexie, Gregory Maguire, Cory Doctorow, Jules Feiffer, Linda Sue Park, Walter Dean Myers, Lois Lowry, Kate DiCamillo, M.T. Anderson, Louis Sachar, Chris Van Allsburg, and Stephen King. They run the gamut from what happens when you sweep things under the rug, bottling a cruise ship, moving wallpaper, and a house turning into a rocket ship. They’ve all got a touch of fantasy, and some were quite unsettling, which I didn’t expect but loved.I enjoyed all the stories, but my favorites were Under the Rug by Scieszka, The Third-Floor Bedroom by DiCamillo, Just Desert by Anderson and Captain Tory by Sachar. I’d recommend this for the young and old alike. This follow up to Van Allsburg's infamous picture book is, like most collections composed of a sampling of different writers, a mixed bag. Happily, most of the stories are enjoyable, and some are excellent. Tabitha King's stands out as the least impressive (per usual with Mrs. King, one wonders if she'd have any career were she not married to Stephen King), and for my money the best is Sherman Alexie's wicked tale of two twins whose nasty pranks come back to haunt them. The rest of the stories run the gamut, from Louis Sachar's poetic and mysterious "Captain Tory", Gegory Maguire's amusing and charming "Missing in Venice" and Stephen King's Bradbury-nod, "The House on Maple Street", to the rather un-developed "Third Floor Bedroom" by Kat DiCamillo and Walter Dean Myers disappointing "Mr. Linden's Library" which fails to even really tie itself back into the picture that is its inspiration. The illustrations remain as haunting and delightful as they ever were and it's fun to see how each writer's distinctive style emerges despite the common source material. A definite and welcome addition to any library where the reader is already familiar with the first book and, like me, grew up pondering its mysteries. A weird book, as weird in its way as the original picture book. Every story is well crafted, some are standouts, and none really pander to the children who will be reading them. The short stories are interesting and challenging, and most look for the reader to find meaning between the lines. Most of the tales veer into sci-fi and fantasy, as you'd expect, and many remind me of the stories from the old science fiction magazines I used to read in my early teens that led me into the genre of science fiction. Of the stories, kids will probably most enjoy the more straightforward tales by Scieszka, Linda Sue Park, Lowry, Sachar and Stephen King. Deeper readers will like the efforts of Tabitha King, Myers, Doctorow. My favorite story was Sherman Alexie's disturbing A Strange Day in July. I would NOT use more than one of the stories if I was using the original picture book for writing prompts, but save a few of the stories for after the writing unit. Warning - kids may have a hard time with some of the more "unfinished" stories that seem more open-ended. Best for 5th/6th and older students who still love Van Allsburg's books. First of all, I must confess that The Mysteries of Harris Burdick has long been a mainstay in my writing toolkit. For several years, I have used the illustrations and their captions as story-starters for my students at all levels, from middle grades to graduate students. There is something compelling about the captions and the artwork that simply begs writers to tell a story or two. The combination somehow makes writers out of the most reluctant ones. In this book, something of a tribute to the original title, fourteen writers offer their take on the 14 different illustrations in the book. Some of the resulting stories are humorous while others are downright scary. All are sure to make readers think--and then think again. It would be difficult to choose a favorite short story from among these creative offerings. Teachers will want to add this one to their bookshelves so their writers can compare their stories to those told by these talented men and women. My only question is what took so long for someone to envision this project? I think any fan of children's books would be familiar with the works of Chris Van Allsburg. After all, he's written Jumanji, The Garden of Abdul Gasazi, The Polar Express and many others. One of which was a beguiling collection of strange pictures with tantalizing captions called The Mysteries of Harris Burdick. In that book you were left to wonder what the stories were surrounding these unconnected pictures. Now 14 authors are trying their hand at it and the result is this handsome book. I decided to read it aloud to the kids. (I needed a book and this was handy.) Some nights I read one story, most others I could read two before lights-out. It's a pretty solid collection, there were only a couple stories I didn't really care for. One that the kids particularly liked was the third one, written by Sherman Alexie. It featured two naughty siblings and my kids giggled like mad as I read it. The last story was one by Stephen King and it's the longest of the bunch. Kids were riveted and had to tell Mama all about it afterwards. Fun stuff. We borrowed this book along with The Mysteries of Harris Burdick from our local library. We read that book first, coming up with our own short stories to go along with the fourteen pictures. Then, we embarked on a journey to see what other authors came up with. From the moment we saw that the introduction was by Lemony Snicket, we were hooked. Our girls loved the stories and I was excited to see so many of our favorite authors pitch in to contribute tales. I'm not sure what took us so long to finish the book (we even had to borrow it again in order to finish it), but we stalled about two-thirds of the way through. Overall, though, once we got back into the book, we enjoyed reading a story each night until we finished. Finding this book was a fannish dream come true for me: Chris Van Allsberg is one of my favourite contemporary illustrators, and the list of contributing authors blew my childrens/YA-lit lovin' mind: Kate diCamillo, Jon Scieszka, Lois Lowry, Cory Doctorow... I also loved the Twilight-Zoney Mid-Twentieth Century vibe, which is right up other fannish alleys of mine.Some of the stories are fairly dark and/or trying too hard to be deep and literary, I think, which would make them challenging for younger readers.I've read very little Stephen King (any? maybe some excerpts in class?) but his story, the longest piece and the cornerstone of the collection, does stand out as particularly strong. And Cory Doctorow's brilliant contribution is a surprisingly elegant, and emotional, foray into the physics of parallel universes.I might not have loved every story, such is the nature of anthologies, but this is one book I'll treasure. This book was doomed to disappoint me. I loved the original book and imagined the stories many of the pictures illustrated. I even wrote my own story for the picture "Mr. Linden's Library," which, obviously, was nothing like the one in the book. I can't imagine that any set of stories written about these pictures could ever be good enough because they wouldn't be the ones I imagine.So, what did I think of the book then? I liked it. Several of the stories were a disappointment because either I didn't feel like they captured the essence of the picture or they were a little to gimmicky, but there were several stories (The Harp and The House on Maple Street were my favorites) that really caught my imagination and explained the pictures better than I ever did myself. I think that this book could be written again and again, and probably should. It was a fun read. I was blown away by this book, mostly because I have used "The Mysteries of Harris Burdick" in class. I had anticipated using this book in conjunction, first having the students write their own story as I have done in the past, then reading the published story, but I believe that this book is a bit dark for elementary students. I will, however, pass the idea on to my high school English teacher sister. I enjoyed reading the different stories (one per picture) written by well-known authors. It would have been fun to not know which author wrote which story, as I think I would have been able to figure out most of them based on style. Chris Van Allsburg Lois Lowry Kate DiCamillo M.T. Anderson Louis Sachar Stephen King Tabitha King Jon Scieszka - Chris was born in Grand Rapids, Michigan on June 18, 1949, the second child of Doris Christiansen Van Allsburg and Richard Van Allsburg. His sister Karen was born in 1947. Chris’s paternal grandfather, Peter, owned and operated a creamery, a place where milk was turned into butter, cream, cottage cheese, and ice cream. It was named East End Creamery and after they bottled the milk (and made the other products) they delivered it to homes all around Grand Rapids in yellow and blue trucks. When Chris was born, his family lived in an old farm house next door to the large brick creamery building. It was a very old house that, like the little house in Virginia Lee Burton’s story, had once looked over farmland. But by 1949, the house was surrounded by buildings and other houses. Chris’s father ran the dairy with Chris’s three uncles after his grandfather Peter retired. When Chris was three years old, his family moved to a new house at the edge of Grand Rapids that was part of a development; a kind of planned neighborhood, that was still being built. There remained many open fields and streams and ponds where a boy could catch minnows and frogs, or see a firefly at night. It was about a mile and a half to Breton Downs School, which Chris walked to every day and attended until 6th grade, when the Van Allsburg family moved again. The next house they lived in was an old brick Tudor Style house in East Grand Rapids. It was a street that looked like the street on the cover of The Polar Express. The houses were all set back the same distance from the street. Between the street and the sidewalk grew enormous Elm trees whose branches reached up and touched the branches of the trees on the other side of the street. Chris moved to this street with his mom, dad, sister, and two Siamese cats. One named Fafner and the other name Eloise. Chris went to junior and senior high school in East Grand Rapids. He didn’t take art classes during this time. His interests and talents seemed to be more in the area of math and science.